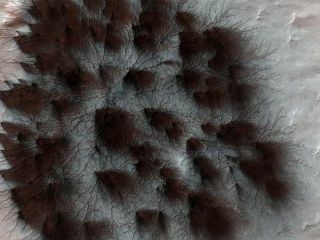 Solid carbon dioxide, commonly known as dry ice, thaws directly to gas and forms starburst patterns under the seasonal carbon dioxide ice caps when spring comes to Mars' polar regions. Image taken by the HiRISE camera on the Mars Reconnaissance Orbiter. A Martian orbiter has spotted seasonal footprints ofspring creeping up on the red planet. Seasonal polar caps formed from carbon dioxide have begunvaporizing or changing directly from solid ice to gas, and have kicked off achain of events detected by NASA's MarsReconnaissance Orbiter (MRO). "Spring on Mars is quite different from spring onEarth because Mars has not just permanent ice caps, but also seasonal polarcaps of carbon dioxide, familiar to us on Earth as dry ice," said CandiceHansen-Koharcheck, an MRO scientist at the NASA Jet Propulsion Laboratory inPasadena, Calif.
Ice caps form each Martian winter as carbon dioxidechanges directly to frost and builds dry ice layers more than three feet thick.The arrival of warmer spring temperatures thaws the solid carbon dioxide andthins the ice cap from both top and bottom. The carbon dioxide gas beneaththe ice cap often flows in the same places each year, eventually creatingchannels or troughs in the planet's surface. MRO has spotted many such spiderynetworks of cracks that remain even after the ice caps have vanished. Pressure from the newly thawed gas also builds up beneaththe thinning ice cap, which can lead to puffs of escaping gas and dust wherethe ice cap has cracked. "What happens on Mars, we think, is that as theseasonal ice cap thins from the bottom, gas underneath the cap builds uppressure," Hansen-Koharcheck said. "And where gas under the ice findsa weak spot or a crack, it will flow out of the opening, often carrying alittle dust from the surface below." That dust ends up swirling about in the wind beforesettling in fan-like or starburst patterns, pointingin the direction of the prevailing wind at the time. Each patternrepresents a jet of gas that was active at one time. The Martian process differs from springtime thaws onEarth, where frozen water melts from solid to liquid and becomes runoff. Scientistshave yet to spot flowing water on the Martian surface, though some suspectliquids may lie beneath the surface or even insidea volcano.